The Full Moon in Capricorn which arises on June 27 or 28, depending upon your time zone, has a ripeness best enjoyed by those who possess resilient persistence and can maintain diligent insistence on doing what must be done. Saturn and Mars take center stage at the Capricorn Full Moon, the planets who have borne the roles of malefic and trouble making nemesis with dramatic flair within the history of astrology. Yet there is also the ancient line of thought that essentially all of the planets are holy agents of the world soul who always bring opportunities for developing and refining our nature. It’s true that Saturn can open us to transcendent insight, while Mars can incite the courage needed for dynamic reform and inspired creation. However, much of the time we experience growth through hardship, letting go, surrendering, or needing to overcome overwhelming odds. The Capricorn Full Moon signifies a time in which challenging difficulties are highlighted rather than unobstructed flow. The Moon’s fullness irradiates how to work with energy levels within the stinking decay of societal structures and promising movements of fresh innovation. The Full Moon in Capricorn illuminates a reality check on deep, underlying shifts beginning to take shape in our lives. The Full Moon is in the earthen, inwardly directed home of Saturn and forms an exact conjunction with the ringed planet as it culminates in full light. This creates an intensely Saturnine lunation, and while Saturn may generally make you think of the hardening and solidifying of forms that resist change, there is another astrological event occurring simultaneously that signifies a monumental alteration of life narratives. This is because a day before the Full Moon the fiery red planet Mars stations retrograde in Aquarius, the airy, outwardly directed home of Saturn that readily formulates plans to structure future vision. The Full Moon uniting with Saturn thus brings a fully lit glare of Kronos to the changes underway, whether they are already occurring at a rapid pace or instead are slowly showing initial signs of deep-rooted modification. The Full Moon peaks less than sixteen hours after Saturn forms an exact opposition with the Sun, demarcating the heart of its retrograde period (Saturn is retrograde from April 17 – September 6) when Saturn is at its brightest phase as an Evening Star as well as closest to us in orbit. Saturn has been in Capricorn for over six months now, and so with reflection the correlations within both collective and personal experiences will become clear. Saturn in its nocturnal home brings the gravity of stone to decision making, and so we can feel the weight of our choices more tangibly, more readily sense the realistic amount of time and space we have to work with. Saturn in Capricorn demands responsible and patient persistence, yet its cardinal and earthy nature also opens the potential to source foundational change in the sustenance of our life. When we work with Saturn in Capricorn while detaching from the dogma of how we have been conditioned to believe things must be, the nourishment of imaginative visioning allows us to actively work with the Capricorn gift for molding materials in new and improved ways. Saturn receiving the spotlight of the Full Moon is ideal for looking back over the course of the past six months and contemplating what’s been working well and not so well in your co-participation with its plodding course through the sign of the Sea Goat. While many people appear to react in habitual, unmindful ways to the changing currents of life, we all possess the capacity for the self awareness necessary to break ourselves free from past patterns of behavior and open ourselves to direct engagement in the moment. As the Saturnine light of the Full Moon blossoms while Mars stations retrograde, it will be easy to feel overwhelmed by past and current sources of stress. If possible, find ways to detach in protective space in order to access the gift the lunation offers for reformulating strategies for the next steps to take in future plans. Mars stationing retrograde is a big deal because the retrograde movement of Mars is the most rare of all the planets, occurring roughly every twenty six months or so. Furthermore, Mars moving retrograde in Aquarius has been the most rare of all Mars retrograde transits in the recent era, as we have not experienced a Mars retrograde in Aquarius since 1971. This particular Mars retrograde in Aquarius is even more volatile than normal for a few reasons. For one, Uranus in Taurus is in range of a catalytic, change inducing square aspect with Mars, ramping up the unexpected quality of martial change immeasurably. In addition, Mars is stationing in conjunction with the South Node of the Moon in Aquarius as we enter a season of lunations aligned with the transiting lunar nodes- this results in three eclipses in a row following the Capricorn Full Moon (Partial Solar Eclipse in Cancer on July 12; Total Lunar Eclipse in Leo on July 27; Partial Solar Eclipse in Leo on August 11). Weaving all of this together, we can know for certainty that more than the normal amount of unpredictable change is on the horizon. As a result, the Full Moon aligning with Saturn is a gift in terms of digging into the roots of our situation to assess the state of our foundation. Life narratives shift when Mars moves retrograde, pivotal figures enter our lives while other relationships fade away. Unlike the underworld retrograde movements of Mercury and Venus that involve both planets disappearing from view, Mars is brightly lit against a backdrop of starry firmament the entire time it is retrograde. In fact, Mars will be as bright during the upcoming retrograde as it has been since 2003. The wandering celestial objects such as Mars signify how we live in a world of constant flux, ceaseless death and birth; in contrast, the fixed stars that rise and set each night in the same places they have for ages past signify enduring aspects of the eternal. The glowing redness of Mars will be bound to our night sky as it appears to move backward through our zodiac, providing the opportunity to turn away from passing fancies and toward our inner realm of deep desire resonant with the eternal world of soul. Mars retrograde is less effective for the usual, status quo operations of the consensus, more resonant with a turn toward the unusual, irrational, unexplainable places where passions are visceral, purely sourced from within rather than projected based upon external rewards. Mars in Aquarius is a fascinating sign for the red planet to station retrograde in while conjoining the transiting South Node of the Moon. Mars is an outsider in Aquarius, and this unique environment for Mars to operate within cultivates a martial force like nowhere else. Mars can be fierce and protective in Aquarius, yet also has a strange mix of objectivity, humanitarianism, experimentation, and determination we do not quite find in any other sign. Mars retrograde in Aquarius can ultimately aid us in discerning how to catalyze necessary growth through detaching from consuming, subjective emotions like anger and frustration. Its union with the South Node of the Moon brings the opportunity to burn off old martial identities on the fires of purification. However, we also need to remain aware of the shadow side of Mars in Aquarius that can become overly detached from the consequences of its actions due to the fervor of its idealistic convictions. While we will need to have the awareness to cool it down when rising inner heat is leading us into unnecessary conflict, our relationships and community will also need us to maintain a heart-centered connection with what needs to be done and who needs to be protected. Aquarius is the sign of the Water Bearer who carries and shares the enlivening water of consciousness that nourish humanitarian impulses. With Mars retrograde, the water poured throughout the collective will be dissolving fixed structures and opening spaces within the fields of power for new voices to emerge within a state of rearrangement and reformulation of dynamics. Moreover, with Mars wrapped up intensely with Uranus in Taurus during its retrograde, its more likely than normal that rapidly developing, nonlinear revelations will emerge that can be challenging to integrate into our sense of personal identity as well as work with in the established structures of our life. Rather than dissociating or splitting off what feels difficult to embody or receive within surrounding circumstances, it will be important to find ways to responsibly work with the sudden Uranian insights in tangible ways, finding acceptance for how old conceptions of our identity mutate. Aquarius hosting the opening of the Mars retrograde signifies that outsiders will take center stage, and so it is not surprising that a ramping up of debate and conflict over immigrants, refugees, and asylum seekers erupted as Mars slowed down to station. The collective conflicts building now will not be resolved any time soon, and similarly we can expect that any personal conflicts arising now will also endure an extended battle before finding resolution. Aquarius is a sign known for being able to keep a steady pace of endurance, a quality we will need to integrate rather than insisting on rash, impulsive action. Aquarius is also optimal for abstract strategizing, and so as we navigate the storms brought by Mars retrograde clashing with Uranus and a season of eclipses, we can receive new ideas and solutions for old dilemmas, new questions that lead us to new answers and reframing. It’s also important to keep in mind that the trajectory of the Mars retrograde leads it to eventually station direct at its exaltation of 28°37′ Capricorn on August 27. Mars ending its retrograde on its most exalted degree of the zodiac suggests out of all of the struggles that come about in the next several months, in some way a refinement of a more exalted martial quality may be discovered and then embodied on the other side. For the time being, it will be much more important to stay present with the task at hand rather than becoming distracted over future expectations. The stationing of Mars also has an important impact on the transit of Jupiter in Scorpio, since Jupiter is in the home of Mars and so looks to the red planet for resources. Interestingly, the Capricorn Full Moon is separating from its conjunction with Saturn and is applying toward a sextile with Jupiter retrograde in Scorpio. This is yet another sign of growth being able to be found through suffering and deep penetration into the actual reality of circumstances rather than denial over what’s really going on beneath the surface. Jupiter is getting closer to the end of its retrograde phase at the Full Moon, eventually stationing direct during the forthcoming waning cycle of the Moon at 13º20′ Scorpio on July 10. Mars is stationing in range of a wide square to Jupiter, and since they are occupying signs that square one another it signifies we will be going through one of our deepest dives yet into the realm of shadow with Jupiter in Scorpio. A pull into the shadow of our subconscious, revealing intimations of what we have been refusing in one way or another to acknowledge about ourselves, will be amplified further by the fact that the Mars retrograde will be taking it into extreme southern latitude relative to the ecliptic. Gary Caton has been doing innovative work with the retrograde loop patterns of Mars and at UAC 2018 gave a talk I was fortunate to attend in which he stated that when planets go into southern latitude they call us to dig deep into our subjective senses to discover how we are unconsciously acting out from our shadow. In combination with Mars also stationing in conjunction with the South Node of the Moon, we have repeated signs indicating that the greatest meaning will be found in contemplating our depths, pulling in our energy around a purifying fire we stoke to burn off the past identities and patterns we are ready to now let go of. Not only will Mars become an extremely bright Evening Star in the midnight hour, so will all of the traditional planets be visible following the setting of the Sun as the luminous, silvery Moon rises. As the Sun sets it will be possible in some locations to view Mercury briefly in the shifting hues of twilight, while both Venus and Jupiter will be higher, brighter, and more easily seen for an extended period following sunset. Eventually both Saturn and then Mars will emerge in the night sky. There is fascinating symbolism occurring that as Venus in Leo sets on the western horizon, Mars in Aquarius will begin to rise on the eastern horizon. Taking a break from the toil of the day to attune to the starry night sky will be one available remediation strategy to help with cooling down and opening to a more reflective state of mind as the inner heat stoked by Mars retrograde intensifies. A day after the Full Moon, Mercury will enter Leo and begin to apply toward an opposition with Mars retrograde and a conjunction with the North Node of the Moon. Mercury will form an exact opposition with Mars retrograde on July 5, and so the tension between Mercury and Mars will be intensifying until then. Mercury’s time in Leo this year is one of its most pivotal journeys of the year, for Mercury will later go through a retrograde phase in Leo at the end of July resulting in Mercury remaining in Leo until September 5. The inner desires incited by Mars retrograde can be transmitted into fiery, inspirational communication with Mercury in Leo, but as the opposition with Mars builds in the week following the Full Moon it will be necessary to remain on high alert over the potential of getting drawn into vicious and unnecessary arguments that drain energy and serve no real purpose. There will also be many necessary conflicts to engage in and courageously persist through, and within collective events there will likely be numerous examples of protest movements and fierce public debates between competing interests. The Full Moon illuminates the first decan of Capricorn associated with the Two of Pentacles card illustrated above by Pamela Colman Smith. The image is fitting for the Saturnine Full Moon coinciding with Mars stationing retrograde, as the juggling magician set against a backdrop of a pivotal sea change embodies the capacity of Capricorn to penetrate into structural forms and impact matter from the underlying fabric of reality. Austin Coppock in his book on the decans 36 Faces ascribed the image of “A Headless Body” to the first face of Capricorn, stating it “entails the descent of the spirit into the body of the world itself,” bringing consciousness to deeper and deeper levels of matter to “set those powers in motion” as well as “use the higher, logoic functions to guide them along their course.” Coppock analyzed the ancient attribution by Ibn Ezra of a bestial man carrying a cattle prod to this face, suggesting it reveals the capacity of this decan to not only set material forces in motion but also steer them in order to create change such as new work or sources of sustenance. 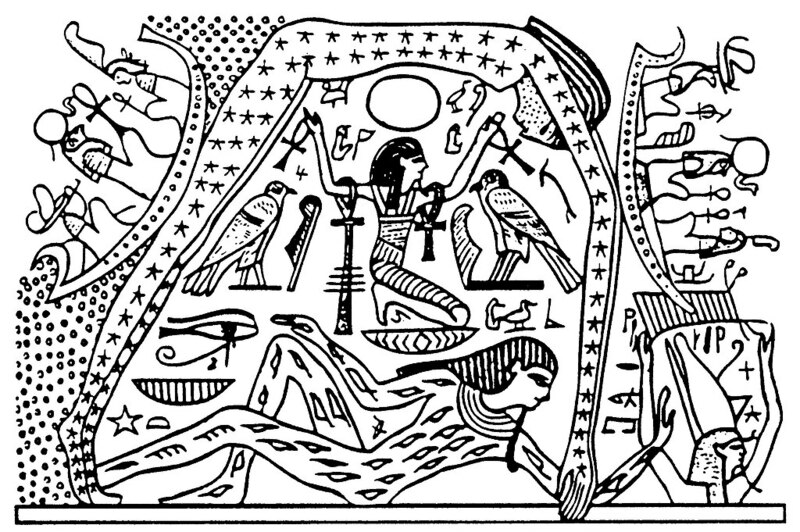 The “atavistic consciousness” Coppock described within the first decan of Capricorn that “descends into the natural world with ease” connects well with the ancient Hellenistic text 36 Airs of the Zodiac attributing the ancestor of earth and body-based healers, Asklepios, to the first face of Capricorn. There is also an Asclepius asteroid #4581 which at the Full Moon is forming an opposition to Uranus in Taurus and square to the stationing Aquarius Mars, at 3º11′ Scorpio. 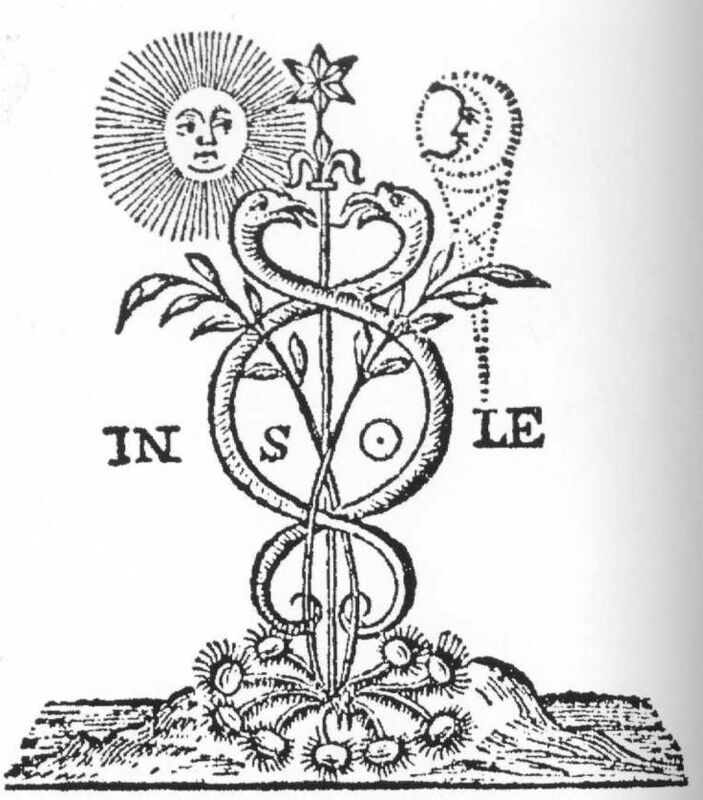 Asclepius, son of the Sun god Apollo and a mortal woman, embodies a centered focus which integrates all surrounding realms, both material and immaterial. Rooted in Earth, Asclepius is a healer who emerges in times of crisis and cathartic change, reverent of Nature, in balance with masculinity and femininity, and reliant upon ritualistic incubation to find healing cures. Asclepius is associated with healing through dreams, an incubatory process that reveals the connection between external symptoms and the underlying unconscious. With his hermetic staff planted in the ground, Asclepius weaves together meaning from celestial and chthonic realms through discernment centered in his sensual nature, applied to his work through disciplined spiritual practice. Jupiter is the ruler of the first face of Capricorn in the Chaldean descending rulership scheme, Saturn the ruler in the triplicity scheme. Both Jupiter and Saturn are key elements of the lunation as already mentioned, but Saturn of course is most impactful due to not only residing in its own face but also its own domicile while receiving the full light of the lunation. If we link a responsible, reverent engagement with Saturn to the noble attributes of Asclepius, we find the ultimate manner in which to navigate the chaotic changes which will be continuing to tear through our global collective in coming months. Walk with full presence, sensual awareness of the myriad fluctuations in growth and decay all around, with willingness to contemplate the synchronous meaning found in dream images as well as passing omens along one’s daily course. There are no easy answers at this time, and it will be necessary to draw upon reservoirs of inner strength to respond to emergent crises. Centering within the integrity of our own essential values, remaining open to protecting and nurturing those in need, will be ways to find the optimal path forward. So much in this offering, Gray. Not that you’ve ever done less than. But. Great reminder, “all of the planets are holy agents of the world soul.” Love this. It’s been a trying time for me, personally – recently emerged from a stint in the dark realms, unable and uncaring to see my way out of helplessness and utter despair. From a generation that really believed we were making a difference through Civil Rights and human rights in general, to witness the current meltdown of any sort of humanitarian principles, nevermind ecological reason, has been heartbreaking. Yet once I brought myself back up for air, I realized the raw process of Shadow integration writ large. It’s a test, for sure, to see if we can bear witness to the collective’s most demonic qualities. Only then can we begin the process of transformational healing. And so I once again affirm my inner Hermit, largely staying put in my magical gardens created on our +1/2-acre Paradise. To “find ways to detach in protective space in order to access the gift the lunation offers for reformulating strategies for the next steps to take in future plans” is all I can do. And that has to be Enough. Thank you Bela, I’m very happy to hear this has been helpful. I hope you have been doing well through these intense times! Thank you for explaining how the planets are agents of the world soul and can bring opportunities for refining our nature. That idea really resonates with me. Your explanation furthers my understanding. Thank you for letting me know, Suzanne. I’m happy to hear my phrasing of all that brought you some deeper meaning.